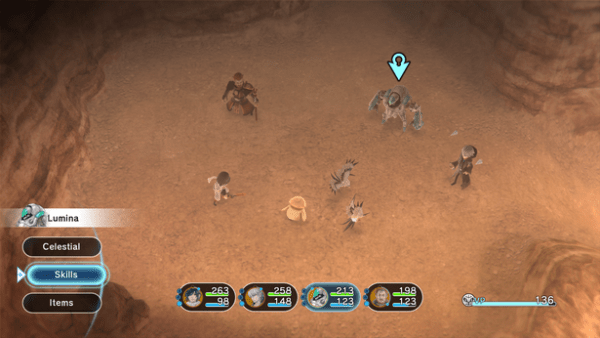 Two years ago Square-Enix and Tokyo RPG Factory released a throwback game in I Am Setsuna. Meant to awaken hints of Chrono Trigger‘s battle system along with simple storytelling, a world map, and a 2D art style. A few years later, comes its spirtual succesor Lost Sphear hitting at the same formula. While also attempting to fix some of the first game’s faults. 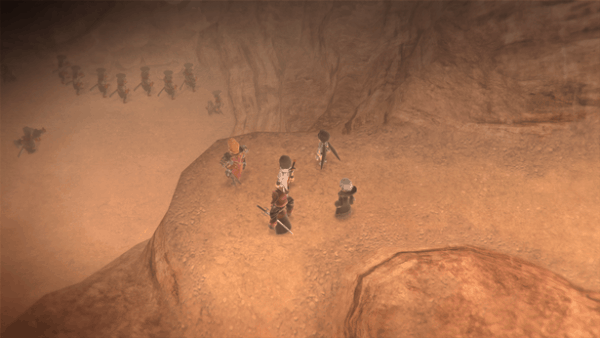 After playing through the demo available on the Nintendo Switch twice, Lost Sphear heads in the right direction. The demo begins with your party on the World Map. Except this one has parts of it covered in a white cloud. These are called “Lost Points” and you must create artifacts around the map to dissolve the cloud. Artifacts help give the team advantages in battle. For example, the Magic Eye is like “Scan” in other RPG’s. Giving players the ability to see the opponents HP and ATB charge gauge. Another, Yggdrasil increases physical attack, while at the same time decreasing magic attacks. These artifacts are created with memories, which you gain from chests or by winning battles. The demo grants you the chance to see both aspects of that in action. Once you set the three lost points, the map completely opens up with lush green areas, sandy mountains, and rather barren rocky area. Your party is pushed towards the town of Sacred Rahet. Where the rest of the short demo takes place. What unravels throughout the one hour tale, gets at the heart of many great adventures. Kanata is blessed with the power of controlling memories and making them into artifacts. He and his friends are hired by the Empire to capture the rebels, called the Twilighters. The Empire has charged these Twilighters with using monsters for their own benefit. Thus introducing the “lost” phenomenon onto the world. While the rebels say the Empire stole all of their “terrormite,” which is a danger in the wrong hands. However, once both conflicts are presented, the party, particularly Oburo struggles internally throughout. Questioning the merits of war and ultimately if they made the right choice. Presenting interesting story threads for the full game. 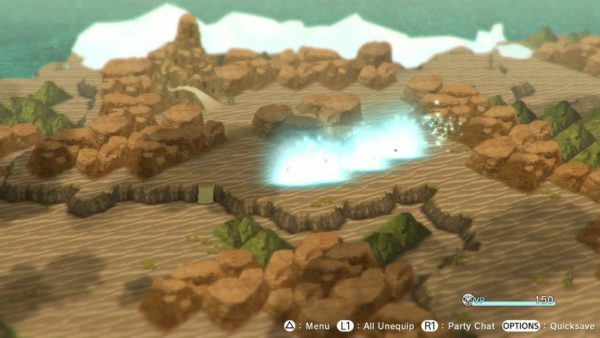 Most of what you experience in the demo comes straight from I Am Setsuna. The active time battle system from classic 1990’s RPG’s is very much present. For the uninitiated, this is a turn-based system where both party members and opponents have a gauge that fills with time. This is all based on speed and happens in real-time as well. So, players have to plan ahead a little bit, because taking too long making decisions can be costly. Enemies can attack you at any time during your turn and they don’t hit meekly either. Don’t worry though, until you get to the boss, none of the battles are difficult. So, it lets you learn the system rather well, before facing a true challenge. 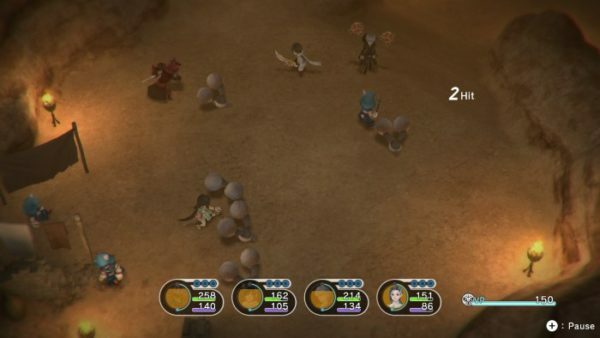 Players can perform normal attacks, special skills unique to each character, or wait until they gain three cores underneath their nameplate. This allows for the unleashing of a super move. I never had to use one of those, but in I am Setsuna they were quite powerful. This whole system is also built on freedom of movement. Moving around to get the best possible angle is important. Mainly because its possible to strike multiple enemies with one attack. So, even though it may seem like you are only going to strike the enemy in front of you, pulling back, or moving around can open up the attack to two or three enemies at a time. Then, there are other attacks which focus on circular motions. For example, Kanata’s “Cyclone” (taken straight form Chrono Trigger) can attack any enemies bunched together. Thus, encouraging you to explore each party member’s set of skills and which attacks are right for every situation. 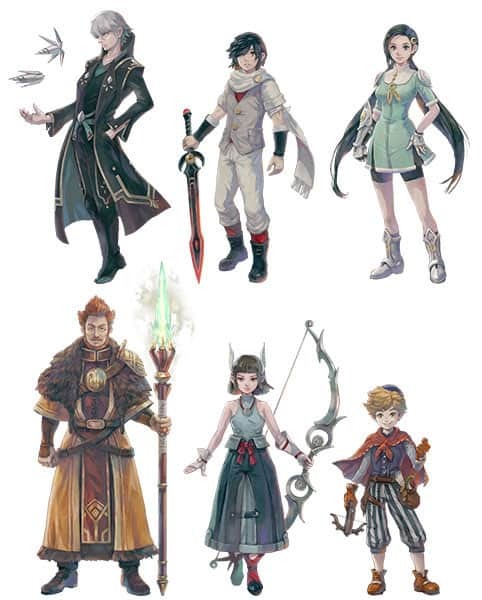 The major difference from I am Setsuna to Lost Sphear is the introduction of Vulcosuits. 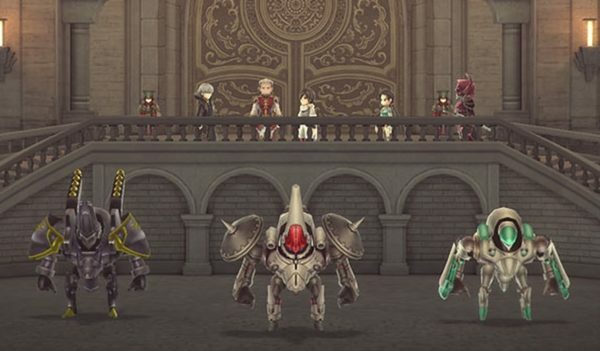 Outside of battle, with the click of one button (L on Switch) you can transform the entire party into their Vulcosuits. These suits are very strong and in the demo are used for one purpose. Destroying rocks to help find hidden items. In the full game, they will have many more uses. However, the interesting thing about these suits is that they present a different strategy in battle. Unless you go into battle with everyone transformed, you must change everyone in and out of their Vulcosuit individually. Each Vulcosuit has a special ability. For example, Kanata’s has Co-op, which does a powerful double team move, as long as there’s another Vulcosuit present. I don’t want to spoil everything so I’ll just use the one example. Although, suffice to say that each ability is worth checking out on its own. However, Vulcosuits do have a drawback, the big moves are controlled by Vulco points or VP, which you can clearly see on the right side of the screen at all times. Vulcosuits become useless in battle when the meter reaches 0. So, players must manage the use of the Vulcosuits wisely. Personally, I didn’t use them much. Finding it much easier just to use the regular party. Outside of Oburo, the other three characters are rather strong on their own. Especially the fighter Lumina. There’s also another drawback to using them in battle as well. Since they are stronger, it makes the final battle in the demo much harder. This is mainly because the War Maiden Sherra uses a charm arrow as one of her attacks. Giving her control of any party member she strikes with it. Imagine if she takes control of someone in a Vulcosuit. Those things hit pretty hard, and I died a few times because she took control of the wrong character and decimated my party. So, once again use caution against certain enemies and bosses with the Vulcosuit. Learn to battle with both versions of the party. 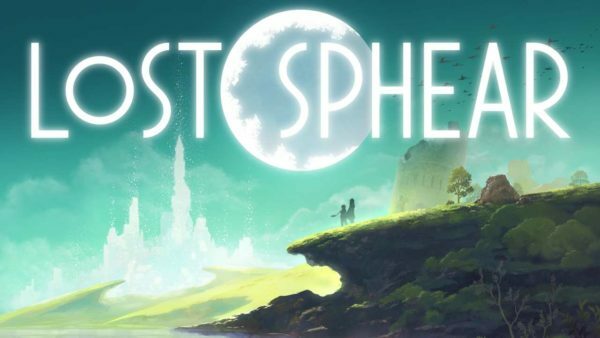 Lost Sphear certainly follows in the footsteps of its predecessor in many ways. However, in just this short hour, I found myself much drawn to the characters in this game, then throughout the length of I Am Setsuna. The interesting mechanics brought forth with the “lost points” on the World Map, and the addition of the Vulcosuits are very welcome as well. Not to mention, it brings back the familiar and beloved battle system from before too. So, it looks like Lost Sphear is set to impress when it releases on January 23, 2018 on Nintendo Switch, PC, and PlayStation 4.